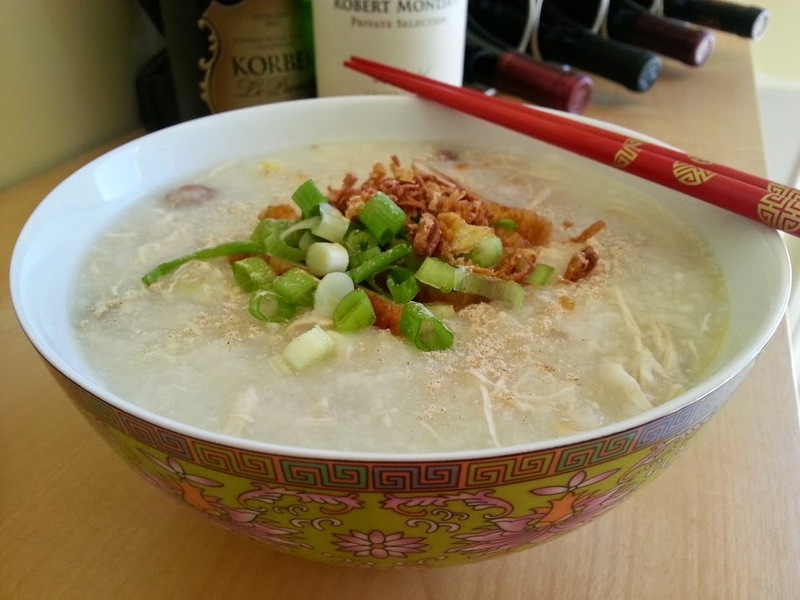 My husband’s favorite dish: chicken porridge with peanuts, fish cake, and the miracle topping – fried shallots. A good dish to cook on weekends for lunch. 1. Wash and clean chicken. 2. Boil ingredients for chicken stock in a saucepan. Add chicken and boil rapidly for 5 minutes, reduce heat, cover pan and simmer chicken for 30 mins. 3. Meanwhile, boil peanuts in a small sauce pan for 5 minutes, some of the skin will separate and water turned cloudy. Drain the peanuts, leave the skin behind and set peanut aside. You can also use peanuts with skin removed, then just add the peanuts to the chicken stock in step 7. 4. While chicken stock is boiling, slice and fry fish cake. 5. Remove chicken and immerse in a basin of cold water for 5 minutes. Debone the chicken and set aside. Put bones back in the chicken stock and boil for 30 min. 6. Meanwhile, shred chicken and mix with chicken marinade. 7. Strain chicken stock into a large sauce pan. Add 4 pints hot water, peanuts, rice, 1/2 tsp salt, and 1 tbsp oil into the sauce pan. Boil until rice grains are broken up, stirring occasionally to prevent burning. Cook porridge to your desired consistency; we like the rice grains broken up, but not too thick and creamy. Stir in beaten eggs while porridge is boiling. 8. To serve, scoop boiling porridge into a bowl, top with shredded chicken, fried fish cake, spring onions, dash of pepper, fried shallots, and Chinese crullers. You can also prepare the porridge in a slow cooker. In step 7, put all ingredients into the slow cooker, stir in eggs when porridge reaches desired consistency. You can buy Chinese Crullers from Chinese Restaurant or supermarket.